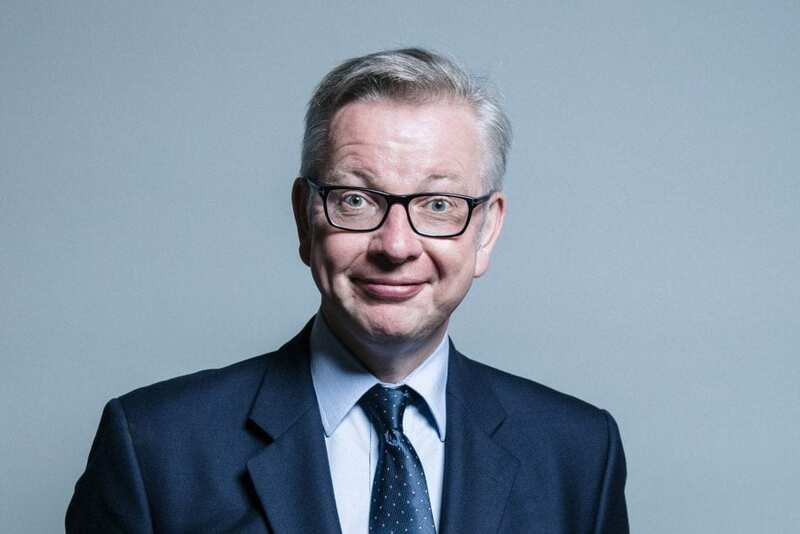 In a change of tone from Theresa May who told workers in a factory that had been given massive EU grants that voting against her deal would mean Brexit might not happen, Brexit cheerleader Gove used an apocalypse metaphor. “We are in a stronger position in the backstop,” he told BBC’s Today Programme, in a statement many of his Conservative colleagues would not agree with, as it would leave Britain at a major disadvantage in the next part of negotiations after a withdrawal agreement is ratified. The UK would be negotiating trade deals to replace EU membership while stuck obeying EU rules with no say over them to keep Northern Ireland from falling apart. The PM’s Environment Secretary said Parliament would damage British democracy if it votes against what is seen as a flawed withdrawal agreement by many on both sides of the Brexit debate in a ameaningful Commons vote at 9pm tonight. “Winter is Coming” is the fantasy Game of Thrones motto of House Stark, whose army of zombie soldiers are hell bent on destroying mankind. Gove’s words are a stark contrast to the sunny predictions he made during the EU referendum campaign in 2016. 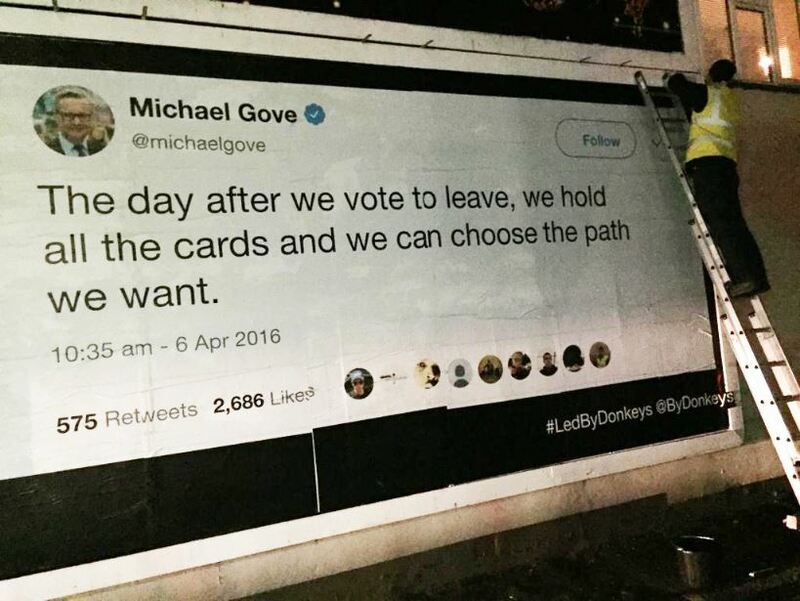 And to remind him of his rash words, mystery pranksters splashed them across a giant poster that appeared in mainly Leave voting Romford on the eve of parliament’s crunch vote. 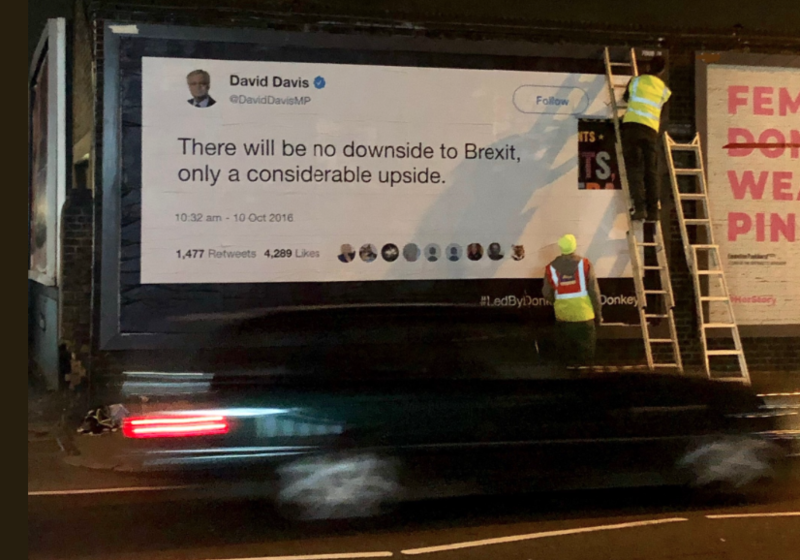 The poster is part of a spate of mysterious billboards spotted trolling politicians with rash promises that they must wish people would forget. “Britain faces a simple and inescapable choice – stability and strong Government with me, or chaos with Ed Miliband” the former Tory PM warned solemnly. And we all know how “stable and strong” things have been since he uttered those words, resigned straight after losing a divisive EU referendum campaign, which has left Britain with so much stability that we need this poster to remind us thanks! The next poster to appear contained these perhaps over-optimistic words from David Davis who resigned as Brexit Secretary last year, angry at the Brexit deal he had been responsible for working on. The mystery posters were put up by Led By Donkeys who remained tight-lipped about who they are but told The London Economic: “We feel we’re offering a public information service. Led By Donkeys say they are “a merry band of concerned citizens” and not affiliated to or involved with any political Brexit groups.